Treat yourself to a painting adventure in Georgia O'Keeffe's own backyard, made famous by the landscapes she captured on canvas. Join us as we walk in her footsteps and try techniques that guided her art. I worked for O’Keeffe in 1976, then went on to my own career in the visual arts. Bring your favorite painting media and enjoy an unparalleled experience in the land that inspired O’Keeffe. Only 12 spots are available. Sessions mornings (9 a.m.–noon) and evenings (7-8:30). Afternoons free. (Meals served 8 a.m., noon, and 5:30 p.m. The studio will be open all hours for those who want to work during free times. You can stay later on Sunday, after you empty your room by 10 a.m. And you can also arrange to pay for lunch and dinner or even an additional day's stay. Sunday, Sept. 8 Check-in begins at 3:00 p.m. Dinner is 5:30-6:30. After dinner: welcome, orientation, introductions, and a course overview. Friday, Sept. 13 Checkout by 10 a.m. Participants bring their own supplies for painting in their favorite medium (oil, acrylic, pastel, watercolor). Sturdy easels are available in the studio, and iconic views are right there, outside the studio. Those who want to paint farther afield can bring their own portable easel. Also Bring comfortable walking shoes, a brimmed hat, sunscreen, clothes for changeable weather (hot/cool, rain/sun), a water bottle, and a camera if you have one (on a phone is fine). The instructor will bring materials for demonstrations and provide supplemental supplies for experimentation. This course is ideal for those who have experience painting and want time to dedicate to their work, a fresh start, inspiration, or a special "O'Keeffe experience." Enjoy a supportive atmosphere and learn about Georgia O'Keeffe and how she approached her own painting. 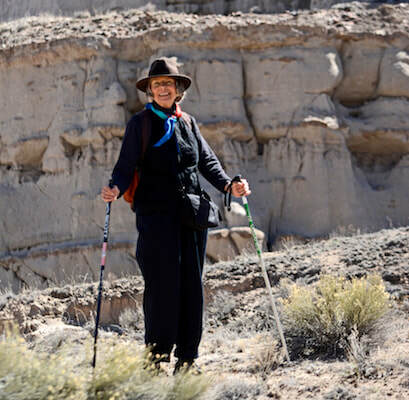 I first taught at Ghost Ranch in the 1970s, then returned in 2015 to lead annual O’Keeffe-related courses. I have also taught at the Georgia O’Keeffe Museum (Santa Fe), Palo Alto (CA) Art Center, and San Jose (CA) Museum of Art. I have two art degrees (BA and MFA) and worked at art museums for 35 years, including 15 years at Stanford University’s Cantor Arts Center. Learn about me at my website: www.annakoster.com. See my resume. Visit our Facebook group “Lessons from Georgia O'Keeffe's Art, Life, Landscape,” where you can view posts or join the group to share ideas and art. If you have questions, you can email me through the "Contact" page of this website. • For its accuracy and detail, I like Roxana Robinson's biography Georgia O'Keeffe, first published by Harper & Row in 1989. Portrait of an Artist: A Biography of Georgia O'Keeffe by Laurie Lisle, from Washington Square Press, is also respected and is easier to read (fewer details). • John Poling was my immediate next-door neighbor, he wrote Painting with O'Keeffe, about his experience helping Georgia O'Keeffe, which covers much of the time I worked for her.